The Argonauts led the Roughriders 18-3 after three quarters, trailed 21-18 inside the final three minutes, and still won. Through three quarters of Sunday’s CFL East Division final, the Toronto Argonauts led the Saskatchewan Roughriders 18-3. With less than three minutes left, the Roughriders led 21-18. And yet, the Argonauts managed to come up with a 25-21 victory to advance to the 105th Grey Cup, an appropriate ending for a bizarre game that featured four interceptions, the first playoff touchdown pass by a Canadian quarterback since 1969, Saskatchewan wide receiver Duron Carter forced to play defense on Toronto’s final drive, an incredible punt return touchdown, an ill-advised final lateral turning into a game-clinching fumble and much more. Even the setup of this game was odd, with 9-9 Toronto hosting 10-8 Saskatchewan (a West Division team) thanks to the CFL’s crossover rules. The Roughriders finished fourth in the West with a better record than the third-in-the-East Hamilton Tiger-Cats (6-12), so they took the third Eastern playoff spot, and then beat 8-9-1 Ottawa on the road last week to create this matchup. But it didn’t go well at all for them until the fourth quarter. The Riders’ defense limited the Argonauts’ points and kept them in it, but Saskatchewan trailed 7-3 after the first quarter, 17-3 after the second and 18-3 (thanks to a rouge off a missed field goal) after the third. Part of that was thanks to the Riders switching between quarterbacks. Veteran Kevin Glenn started the game but went just six for 11 for 87 yards with an interception before Canadian quarterback Brandon Bridge was subbed in in the second quarter. Bridge struggled at first, too, though, and Saskatchewan then went back to Glenn, who promptly threw picks on the next two possessions. That led to Bridge coming in for good in the second half, and while he wasn’t able to do too much in the third quarter, he got the offense moving in the fourth. Bridge hit Carter (recently seen taking Riders’ fans to the movies) for 35 yards, then ran for 36 yards himself and then hit Carter again for an 11-yard touchdown. However, Toronto quarterback Ricky Ray then produced his best drive of the game. Qudarius Ford returned the kickoff 34 yards to the Argonauts’ 42, and Ray took over with 2:37 left. He then hit DeVier Posey, James Wilder (twice) and Anthony Coombs (twice), but that set up a crucial third-and-five at the Saskatchewan 40, outside of field-goal range. The Riders’ defense ran into injury issues here, though, with defensive back Jovon Johnson getting hurt making the first tackle on Coombs. That led to Carter being subbed in on the defensive side; during the season, he’d been occasionally used at cornerback and even recorded a pick-six against Calgary’s Bo Levi Mitchell (after Mitchell previously tweeted he’d take advantage of Carter on defense, no less), but he was still pretty inexperienced there compared to Saskatchewan’s regular players. And Ray managed to hit Wilder for a 22-yard gain in front of Carter to convert the third and five; he wasn’t necessarily Carter’s man, as there were several Riders in the vicinity, but the defensive injury to Johnson probably didn’t help. That set up a first and 10 at the Riders’ 18 with just over a minute left. Ray threw incomplete on first down but then managed to find former Saskatchewan receiver (traded to Toronto midseason) Armanti Edwards in the middle of a cloud of Riders on second down, creating a first-and-goal at the Saskatchewan one. Backup quarterback Cody Fajardo was stopped on the first quarterback sneak, but converted the second one, putting the Argonauts back in front with just 23 seconds left. Sadly for the Riders, they didn’t have any magic left. Their final offensive play saw a short pass to Carter, which could have set up a Hail Mary if he’d just gone down, but Carter instead lateraled to Bakari Grant, who promptly fumbled to Akwasi Owusu-Ansah (who had a great day with a team-high six tackles, plus an interception, a forced fumble and a fumble recovery), giving Toronto the win. This is an impressive win for the Argonauts, giving them their first Grey Cup berth since 2012. And it’s particularly remarkable considering that it came in a season where hopes for them were pretty low; the team went 5-13 last year and changed their management structure very late in the offseason, bringing in Jim Popp as general manager and Marc Trestman back from the NFL as head coach on February 28, well after the free agency period began. 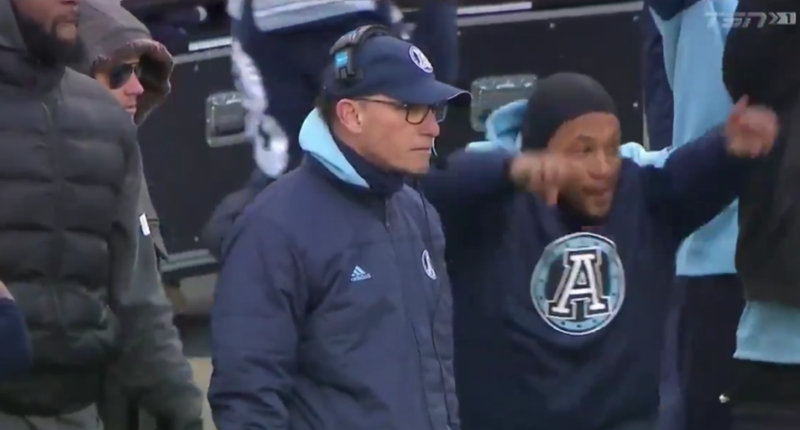 But despite inconsistent results all year, the Argos were able to do enough to finish first in the East and earn that first-round bye, and the Popp-Trestman pairing (previously successful together with the Montreal Alouettes from 2008-2012, appearing in three Grey Cups and winning two in that span) is looking strong again.We’ll see how they do in next Sunday’s Grey Cup, but they managed to pull out a solid victory here, even if it almost didn’t happen.